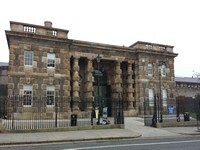 The Crumlin Road Gaol dates back to 1845 and closed it's doors as a working prison in 1996. 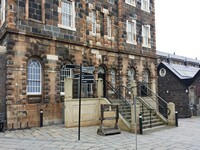 After extensive renovations the gaol has re opened as a visitor attraction and conference centre. 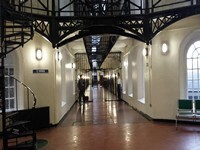 Today you can take a guided tour of the prison and hear about the history of the site from when women and children were held within it's walls through to the political segregation of republican and loyalist prisoners and learn about why the decision was taken to close the prison. 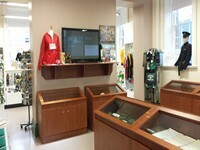 The venues is open to the public 7 days a week. The first tour begins at 10:00. The last tour beings at at 16:30. 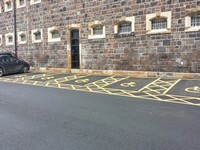 There are 6 designated parking bay(s) within the car park. 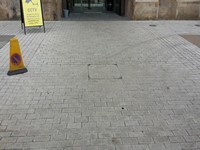 The dimensions of the designated parking bay(s) are 370cm x 520cm (12ft x 17ft). The nearest designated bay is 30m (32yd 2ft) from the ticket office and shop entrance. The furthest designated bay is 54m (59yd 2in) from the ticket office and shop entrance. 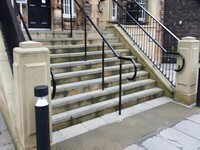 You are on Outside Access (Crumlin Road Entrance). Skip to the next section. This information is for the entrance located along Crumlin Road. The door opening is 118cm (3ft) wide. You are on Level Change (Crumlin Road Entrance). Skip to the next section. This information is for the entrance located at the rear of the ticket office and shop building. This entrance gives access to the ticket office and shop from the car park. You are on Outside Access (Gaol Entrance - Tour). Skip to the next section. 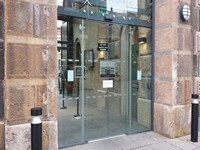 This information is for the entrance located at the side of the Gaol. 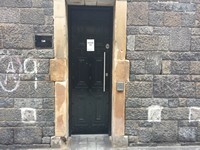 This entrance gives access to basement level of the gaol. You are on Level Change (Gaol Entrance - Tour). Skip to the next section. 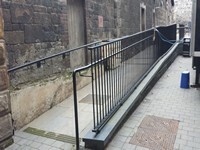 The ramp/slope is located leading from the old Gaol reception. 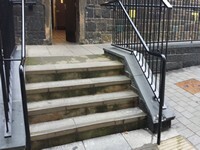 The step(s) is/are located leading from the old Gaol reception. You are on Outside Access (Gaol Exit - Tour). Skip to the next section. 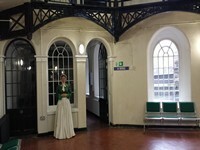 This information is for the entrance located on the ground floor of the Gaol. The door is push pad operated and opens towards you. You are on Level Change (Gaol Exit - Tour). Skip to the next section. 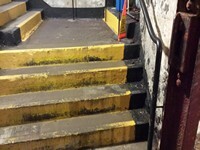 The steps are located just beyond the exit. You are on Lift (Gaol Exit - Tour). Skip to the next section. 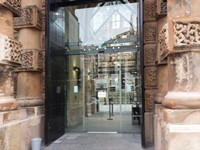 The lift is located to the right as you exit the gaol. The lift is 2m (2yd 7in) from Gaol Exit - Tour. 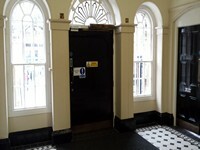 The clear door width is 100cm (3ft). 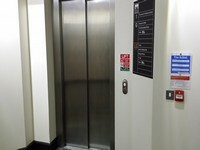 The dimensions of the lift are 100cm x 140cm (3ft x 4ft). You are on Outside Access (The Crum Entrance). Skip to the next section. This information is for the entrance located at the front of cafe. The door opening is 76cm (2ft) wide. The door is push pad operated and opens away from you. Music is played depending on events taking place. There is a fixed hearing loop in the Forbes Board Room. You are on Tour. Skip to the next section. It also goes outside to the grave site. You are on Level Change (Tour). Skip to the next section. 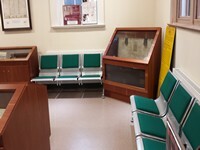 There is easy slope leading to the original gaol reception from the ticket office. There are steps leading down the tunnel between the Gaol and the Old Courthouse. 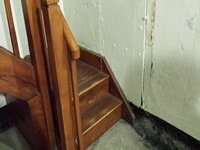 There are also steps leading down from the Condemned Man's Cell to the Dead Mans Cells/Flogging Room. The entrance to the Historic Holding Cell is 68cm wide and the entrance to the Condemned Man's Cell is 60cm wide. You are on Restaurant Bar Internal (The Crum). Skip to the next section. 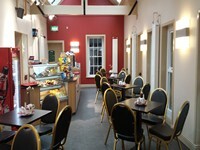 The nearest table is 1m (3ft 3in) from the Crum Entrance. 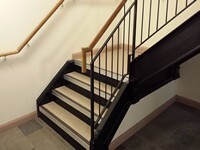 The floors which are accessible by stairs are LG-G-1-2. The lift is located along the corridor. The floors which are accessible by this lift are LG-G-1-2. 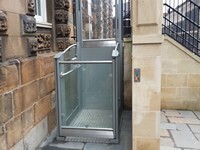 The lift is 25m (27yd 13in) from Gaol Entrance - Tour. The dimensions of the lift are 110cm x 140cm (3ft x 4ft). You are on Accessible Toilet (Lower Ground Floor). Skip to the next section. This accessible toilet is approximately 5m (5yd 1ft) from the Gaol Entrance - Tour. This accessible toilet is located next to the Historic Holding Cell. There is a similar accessible toilet on the ground floor which is 155cm x 215cm and with the lateral transfer space on the left. You are on Accessible Toilet (The Crum). Skip to the next section. 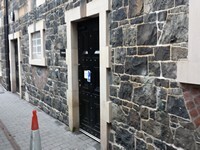 The accessible toilet is 4m (4yd 14in) from the Crum Entrance. 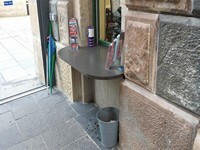 The accessible toilet is located at the side of the cafe. The width of the accessible toilet door is 85cm (2ft). The dimensions of the accessible toilet are 164cm x 240cm (5ft x 7ft). The height of the toilet seat above floor level is 47cm (18in). The female and male toilets are located on the lower ground floor and ground floor. There are grab rails available in some of the cubicles, either side of some of the urinals and either side of the lowered sink.